Your garden and lawn need a lot of care which invite countless tools for the maintenance. With a right tool in your hand, no experience could be better than gardening. A string trimmer is one of those very important tools that your garden direly requires. And a trimmer is of no use without an actively working trimmer head. Today, we are going to discuss best string trimmer head models that will help you with all sort of gardening tasks with utmost easy. You may want to cut the soft overgrown grass from the sideways or kill the weed with a string trimmer. So, without any further delay, let’s start with the leading models in the market. You may also like to read other product reviews such as pole hedge trimmer, gas hedge trimmer, electric hedge trimmer, trimmer line, weed eater, gas weed eater, battery-powered weed eater. The brand Husqvarna is recognized as one of the leading brands in the market to manufacture high quality garden tools. This little head is a great product for the new users as well as for the professionals. This reel is very convenient to reload. Because of the cap on the bump head, you don’t have to turn the head upside down to make replacement. Also, the spool has split design that reduce line welding and tangling. Plus, there are arrows crafted at the head to give you direction of winding the string. This model can hold 0.065 inch, 0.080 inch or 0.095 inch gauge trimmer line conveniently. Also, this trimmer head is very easy to use. You make have the trimmer from any other brand as well and the head will seamlessly fit. Some of the compatible brands are Echo, Stihl, and RedMax as well. Any other brand whose products have straight shanks can use this trimmer head. Also, this model comes adapters of different sizes so that it can fit most of the trimmers available in the market. Next in our list is this extremely basic model from Tanaka. This brand is relatively new in the market but their products are praise worthy. The profile of this model is really small with quick load string that you can wind effortlessly on the trimmer head. This model is no brainer as you can insert the line with a push of a button. There is nothing very unique about the winding of the string in this trimmer head. This one can hold 0.080 inch to 0.115 inch gauge trimmer line conveniently. Also, this trimmer head is very easy to use. But at the same time, it is not suitable for the commercial users because of its smaller size and single line head. The trimmer head is compatible with 95% of the brands selling their trimmers in the market, irrespective of the power type. Certainly, the trimmer head is a great model to purchase in the market and attach to a decent working trimmer to get rid of weed and soft overgrown grass from your yard. If you are looking for the most cost-effective trimmer head in the market then we present you this model from Grass Gator. This one is heavier than the others in the range because it is made of steel. About the size, this head is available in medium size that can be good for medium sized lawns. One thing that you must know is that the trimmer head is best suited for gas powered trimmers and is compatible with different brand trimmers in the market. The performance of this trimmer is really appreciable. Plus, you can rest assured that this trimmer works with your trimmer model from brands like Cadet, Toro, Poulan, John Deer, etc. This model is also the first commercial trimmer head in our list that is preferred by the contractors because it make cutting grass and weed very easy. The trimmer head is suitable for engines that are 25 cc or more in power. This can clearly state that this product is extremely powerful and suitable for bigger gardens and lawns. Again, we come with another amazing model from Husqvarna. This brand has great goodwill in the market for the quality manufacturing of the products. The winding mechanism of this trimmer does not require a lot of prior knowledge about it. There is nothing very unique about the winding of the string in this trimmer head. This model can hold 0.080 inch to 0.095 inch gauge trimmer line conveniently. Also, this trimmer head has simple mechanism of usage. Just like the previous model from Husqvarna, the head is also not suitable for the commercial users because of its smaller size and single line head. This model from Echo is a great commercial trimmer head which makes a perfect addition to your garden tools. This head is of medium size that is why it is compatible for commercial use. Also, the assembling of the head string is very convenient which takes less than 30 seconds or less. The winding of the string is very simple in this trimmer head and it does not require any disassembly. Furthermore, this is a heavy duty product that is compatible with gas powered models with minimum power of 25 cc. Thus, this product is extremely high in performance. Also, it fits all kind of trimmer brands available in the market due to the multiple adapters available with it. The maximum line size compatible with it is 0.130 inch. That is why, this one is an amazing product for professional use. Next, we have got this highly efficient model from Weed Warrior which is suitable for small to medium sized yards. You can consider this one as a semi-commercial model because of its efficiency. It cuts with 4 lines which is very easy to wind. Plus, the quick and easy line loads prevent the tangling of string on the spool. This is due to the sectioning of the inner part of the head that the string does not tangle and hinder the working. Although this is a manual feed head but the winding is pretty simple. The EZ lock replacement trimmer head allows for less stops to change line. This model is compatible with 99% of all gas curved and straight shaft trimmers. You will find this model extremely powerful since it can work with the gas powered trimmers. Last model in our list is from Handy Camel which is an amazing brand that manufactures high quality string trimmer heads. Now, about the features, first of all, there is no need for winding in this model as you can simply insert the line in the eyelids. This one comes with various tools but the assembling is very easy. In order to make no mistakes, you can read the manual that comes along with the product. The reload can be done in seconds and it is no rocket science to make the adjustments in the trimmer head. Also, this one is compatible with all the leading trimmers available in the market. This model is the simplest yet one of the powerful universal string trimmer head that you will simply love to have around in your garden tool kit. A trimmer head is the most important component of a string trimmer. It is the place where you put the strings that cut the overgrown cultivation and kill the weed. These days, you can also buy best universal string trimmer heads that accommodate different tools such as string as well as blades to make themselves more useful to the landscapers. After determining the need of your garden, one can make a purchase. But for all kind of buyers, there are certain tips that can help them in making right purchase. The initial factor that you need to consider is the type of head that you are buying. Primarily, there are 3 main types of string trimmer heads available in the market. Fixed/Line Head: This type requires you to thread individual lines in the head rather than winding the entire spool. Basically, this type is best suitable for the commercial users that need to use thicker lines. Because of the fact that thick lines do not break very soon, you can escape changing them after every usage. This way, the maintenance is less and thus this type is proven to be the most favourable for professional landscapers. Bump Feed: This type requires winding of the lines on the spool through the opening in the head. Feeding of new lines as you cut is convenient because you just have to bump the head on the ground. This one is pretty simple and easy to use. That is why, it is very popular among the home users with smaller yards and sideways. Because of the constant bumping of the head, you will have to replace the strings more often than all other kinds of strimmer trimmer heads. Automatic Feed: The contemporary trimmers have automatic feed that do not require manual feeding of the line. This type consists of line spooling motor which pulls out the line without stopping the cutting. However, you may find this one a little expensive and replacement could be troublesome. Buying Advice: Different type of string trimmer heads has different winding mechanism. If you don’t mind spending an extra buck then you must make your work easy and buy automatic feed. But because bump feed type is easiest to wind, you can consider buying it as well because they are available at a cheaper rate. And trust us, they are not too complex to set. Second thing that you need to determine is the grass type and thickness in order to purchase the right product. Please note that string trimmers are ideal for soft crops and plantation while the best string trimmer replacement head give you the option of changing strings with blades. If you have all kind of branches and side overgrown grass then you need to purchase a product that gives you the option of changing strings and blades. This way, you will be able to handle thickest grass as well to cut the weed effortlessly. Size of the head is also very crucial while making a purchase and it depends on the size of the yard. Smaller head is good for the smaller yards as they can handle less amount of work. At the same time, for larger yards, you will need a trimmer head which has over 0.1 inch diameter. So, all in all, the size of the garden gets to decide the size of head needed. There are also other two types of heads available in the market namely single line or dual line. Both the types have their own merits and demerits that must be considered before you make purchase. In single line head winding new trimmer line is convenient but at the same time the grass is not cut very swiftly. Also, these trimmer heads are not suitable for professionals. The dual line trimmer head cut the branches and grass very quickly and finishes the job soon. However, winding the line is difficult in this case and requires some efforts. You can buy the best string trimmer replacement head from the market but it will be sheer waste if the product is not compatible with your trimmer. We highly insist our readers to read all the specifications given along with the product to make sure that the particular product is compatible with the trimmer that you have. These days, the manufacturers are very particular about the trimmer head that they make and also manufacture them in a way that they are compatible with regular gas and electric trimmers. A 10 feet long string is used in a string trimmer. First you need to cut the string to the half of 5 feet each. You can also use twin strand split line. Of the trimmer head, take apart the cutting head by unscrewing the bump knob and removing the inner wheel and spring. On the top of the inner reel, you will find tiny two holes. This is where you have to insert both ends of the line. Then, simply pull the line through and leave some 2-3 inches outside. Now, simply loop the short ends of the line through the other hole while pulling the long ends in order to close the loop. Now, you have to wind the loop around the wheel towards the direction of the arrow. You may have to apply some pressure in order to securely and evenly wind the loop. As soon as some 6 inches of the line is left, push each string in the holding slot that is marked 0.95 inch. Now, once you are done with the process by far, simply place the spring back on the shaft. Now, you have to find the eyelets on the spring head and pass the strings through. These are the part of strings that will do all the cutting and cleaning task. Now, you can place back the reel on the shaft and set the alignment of the holding slots. For this, you have to compress the spring and tighten the bump knob. Now, gently pull the lines to ensure that they are released conveniently. Once done with this much, you are good to take the trimmer out for cleaning the garden. Make sure that bump head of the trimmer is in fine working condition. 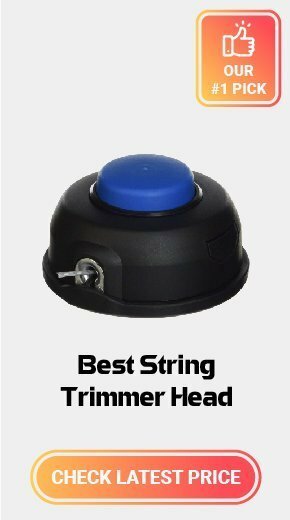 As we conclude this string trimmer head review, we would like to say that a trimmer is of no use without an ideal head attached to it. If you wish to make a safe purchase then you must refer the tips that we have shared above. Moreover, we give you perfect suggestion of the products that you can buy. Check out the above mentioned products in order to make secure purchase because all the models that we have discussed above are the leading ones in the market. So, be sure and proceed with the purchases. Happy Shopping!